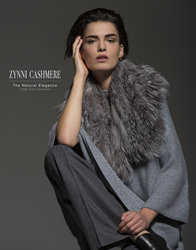 Luxury cashmere label Zynni Cashmere announces simultaneous launch of highly anticipated S/S and F/W 2016 collections, plus exciting new collaborations with NYC Showroom and international luxury boutiques. Zynni Cashmere, the 100% fine cashmere luxury brand created by Qing Hua, a London College of Fashion trained knitwear designer, has put together for the first time two outstanding collections of high-quality cashmere pieces, launching them simultaneously. This comes as a pleasant surprise for all brand aficionados and cashmere lovers alike, since the new collections combines beautifully the muted elegance with high design, and well selected cashmere with chic garments fit for each season and style. To better reflect the richness and color of the season, Qing selects the extra fine and weightless cashmere for the S/S 2016 collection, which is ideal for breezy mornings and evenings. The collection radiates a sense of living and living naturally and stylishly. With density that is 30% higher than that of average cashmere used by even the high end labels, these garments are more comfortable and durable and less likely to peel. In rich shades of ivory, sand and walnut her no-dye garments are the perfect addition to any sustainable wardrobe. These sumptuous designs boast pure cashmere that has never been dyed or chemically processed and thus the integrity of the fabric is well preserved while the impact on the environment minimal. The brand is proud of its partnership with Edite/French Rebellion, NYC, a showroom that houses collections from some of the most exciting emerging international designers. It also partners with Secoo.com, a Chinese luxury fashion E-commerce platform which grants the brand with an online flagship store, as well as offline presence through experience stores in major fashion capitals like Milan, New York, Beijing and Hong Kong. For further inquiries, contact Zynni Cashmere at Info@Edite.US or visit brand’s website at http://www.zynnicashmere.com.